The Dell PERC H200 is a very basic RAID controller that does not have battery-backed cache, and therefore does not let you enable Write Caching within the OS. Writes using the H200 adapter can be very slow, so much that Windows Updates could take 2 to 3 hours on a RAID1! 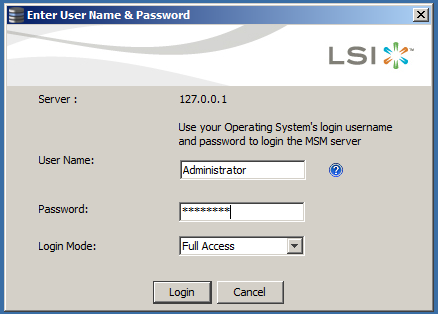 Go to www.lsi.com and search for the latest MSM (or MegaRAID Storage Manager). At the time of this writing, it is 12.05.03.00. Install it, then run it. Log in to MSM using your local/domain admin credentials. 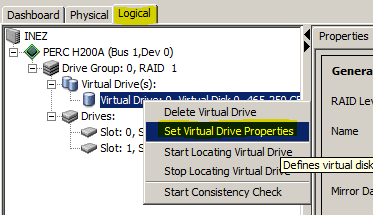 Under the Logical tab, select the VD you want to enable write cache for, then right click and Set Virtual Drive Properties. Enable the write cache and accept all dialogs. Confirm write cache is enabled using Device Manager. My interpretation of “The Dell PERC H200 is a very basic RAID controller” is “The Dell PERC H200 is a crap RAID controller”. Does that sum it up? Yup, even Dynamic Disks can be better than an H200. Hi Gonzalo, i have installed the version you mentioned above. But i don’t get the same login screen you do. My one just goes straight to the console and then says there are no servers found even when it has the correct IP address. I repaired the installation installing everything and then it said there were no controllers found. Does this change cause data loss? It would only cause data loss if you don’t properly “flush” the cache by shutting down the server properly, or making sure all writes are committed. I would discourage from changing this setting on a production server that has no battery backup and won’t shut down automatically on battery power. What would be your recommendation for a better controller and would you know the cost of said controller? You actually can enable write cache using the basic management software that comes with the Dell server. Log in, Select System > Storage > PERC H200 > Virtual Disks. Then on the right hand side, choose form the drop down menu “Change Policy” then execute. Choose to have Write Cache enabled, apply settings. This instantly made writes as fast as my reads up to 2048 chunks. As noted before, do NOT enable this on a server unless you have a UPS device and automatic shutdown is set up on the server. Can you tell me whivh basic software comes with dell? On windows or on linux?